I was in the process of doing a pre-order of there new controller earlier this week when i notice the message on there when I was looking back through at the produces and reading the pdf of the controller. I'm a bit worried now about my personal info has been stolen what should I do? It looks like who ever runs that site has not bother to email there customers to let them know of this problem and is acting like business as usually. Now I'm checking my bank account and paypal like 4 times at because I'm a little scared. I am not rich by any means and cannot afford a big loss. I'm considering closing my paypal just to be safe since it's linked to my bank account. 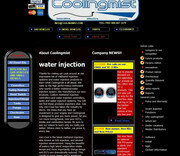 I even did a search on google coolingmist hacked just to see if anyone else has reported this and saw this. Looks like I'll go with Aquamist after all. You guys got any dealers in Kuwait? You be surprised how many fast cars are on the road. We have serious street racing these days. kilometers and kilometers of strait road. I have just stunmbled on this post. Hackers are not nice people, this forum has been hacked so many times and each time took a few weeks to put right because we don't have a full time staff on this. As far as we are concerned, we will not putting on any section with security implications. Loosing access for a few weeks is acceptable on our site. Coolingmist has addressed the issue and I believe it was only a low-level hack, it should not affect the shipping trolly if there was such a service offered. Spammers are a problem for us, emails included. I don't think there is a one-stop solution.